Choice Hotels has Choice Privileges guest loyalty program that comes with three elite tier levels of Gold, Platinum and Diamond with variable benefits. You probably know Choice Hotels from their budget brands such as Comfort Inn, Quality and EconoLodge among others. You can access Choice’s website for status match here and info about status levels here. Note that you can only do status match one time. You should do the status match on or after July 1 because otherwise the matched status only valid for the current membership year. The main benefit of having status with Choice Privilege is the ability to book award rooms up to 100 nights before of your intended stay in case of Diamond. Other programs open award availability when paid booking window opens but that is not the case with Choice. 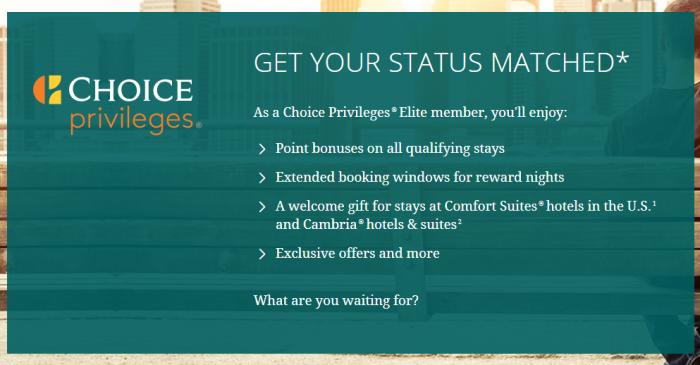 Choice Privileges elite members are also eligible for bonus base points and amenity. Note that the status match is only valid for Choice Privileges members that have their account address in the United States, Canada or Europe. If you are living somewhere else, nothing prevents you borrowing an address from a friend and changing it back to where you live later. Choose 250 bonus points or a snack and beverage at check-in for stays at U.S. Comfort Suites® hotels. Choice Privileges is good choice (pun intended) for those that tend to stay at smaller cities where other chains are not present or prefer staying (and paying too) at economy brands. 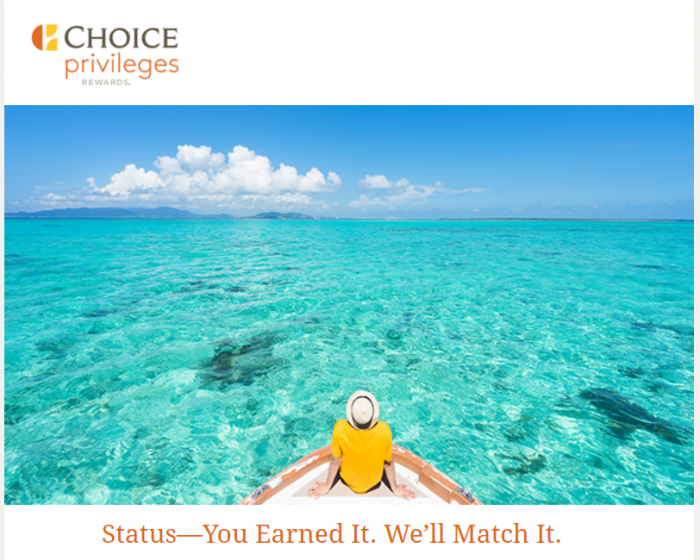 Choice Privileges does run good promotions almost back to back that allows members to elevate their point earnings and earn free nights faster. Having elite status helps redeeming points by allowing booking them earlier than non-status members. The best time to do the match is at the beginning of the July because the status is then valid until the early 2020. * The Elite Status Match Program offer is valid for existing Choice Privileges® members in the United States, Canada and Europe only. Member must provide their name and Choice Privileges member number in the request and provide at least one (1) of the following: i) copy/photo of your membership card (showing expiration date) with other hotel loyalty program, or ii) copy/screenshot of your current account statement with other hotel loyalty program to Status_Match@choicehotels.com (for United States and Canadian members) or Status_Match_EU@choicehotels.com (for European members). The highest elite status that will be awarded under the Elite Status Match Program is Elite Platinum level. One Elite Status Match per member per lifetime. The Elite Status Match is valid for the current year only if status is matched anytime between January – June. The Elite Status Match is valid for the current and following year only if status is matched anytime between July – December. After that time, you must qualify for Elite level status each calendar year. 1 For Elite members (Gold, Platinum, Diamond) with point eligible consumed stays at Comfort Suites U.S. based properties, the member is entitled to a choice of either: i) a complimentary snack and beverage provided at check-in; or ii) 250 bonus Choice Privileges points which will be deposited into the member’s account. Points may take up to four weeks to post to member’s account after stay is consumed. Members can only receive one gift per consumed stay. On a non-point eligible stay, such as a reward night, members may not receive the bonus Choice Privileges points. Choice may periodically modify, suspend or terminate this program at any time, with or without notice, including but not limited to, the benefits noted above. All Choice Privileges Rewards Program Rules and Regulations apply. All hotels are individually owned and operated. 2 For all members with consumed point eligible stays at Cambria hotels & suites U.S. based properties, the member is entitled to a choice of either: i) a beverage coaster which entitles the member to a “buy one, get one free” beverage offer at the Social Circle™ bistro, the property’s restaurant/bar, during their stay; or ii) 250 bonus Choice Privileges points which will be deposited into the member’s account. Points may take up to four weeks to post to member’s account after stay is consumed. Members can only receive one gift per consumed stay. On a non-point eligible stay, such as a reward night, members may not receive the bonus Choice Privileges points. Choice may periodically modify, suspend or terminate this program at any time, with or without notice, including but not limited to, the benefits noted above. All Choice Privileges Rewards Program Rules and Regulations apply. All hotels are individually owned and operated.